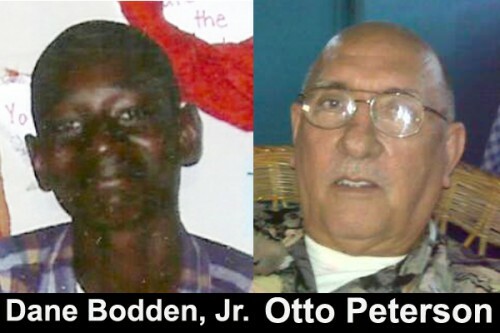 Otto Peterson, 69, owner of the Lords Bank Laundry and Grocery Store as well as former owner of the Oasis Bar at Mile 5 on the Philip Goldson Highway, and Dane Bodden, Jr., 15, of Ladyville Technical High School, were both shot dead in Lords Bank – Peterson on Saturday by thieves during an attempted robbery in his store, and Bodden on Sunday while riding on his bicycle on the Lords Bank Road towards the highway. Police say that on Saturday, December 15, at about 8:30 p.m., they went to Lords Bank to Peterson’s grocery store, and found that he had been shot in his chest and head. He was rushed to the Karl Heusner Memorial Hospital (KHMH) in a private vehicle, but he died on the way. An investigation by police revealed that at about 8:25 p.m., two men went into the store to rob Peterson. Police said that there was a struggle, during which the gunmen fired several shots at Peterson, hitting him in the chest and the head. The gunmen then ran out of the store. Upon their arrival at the crime scene, police searched the area, but the shooters were nowhere to be found. The officers did, however, retrieve two 9mm expended shells in the store. Peterson’s stepson told Amandala that he was in his house when he heard about four gunshots coming from the direction of the store. He quickly rushed to the store to see what was happening, and that was when he saw his stepfather lying on the floor, wounded and bleeding. He said that he picked Peterson up, put him into a vehicle and rushed him to the KHMH, but as they neared the SMART office building a couple miles out the city, Petersen told his stepson to tell his mother not to worry, that everything would be alright, and then he took his last breath and died. The stepson said that the thieves did not get away with anything, and that after shooting his stepfather, they ran out of the store and escaped in a vehicle that was waiting for them. He said that Petersen was hard-working, friendly and easy to get along with. He loved and respected his stepchildren, and never disrespected their mother. They will miss him dearly, said the grieving stepson. No one, so far, has been arrested in connection with the murder. The following day, Sunday, December 16, at about 8:10 p.m., police again went to the Lords Bank area – this time they saw first form student Dane Bodden, Jr., lying face up on the road on top of his bicycle. He had been shot in the left ear, in the center of the chest, and about an inch below his right knee. He was already dead. Police say the shooting happened at approximately 8:00 p.m. A 9mm expended shell was recovered from the area. His mother, Elaine Flores, said that she was at home when she heard four gunshots, and shortly after a person came to her house and shouted for her. She said she knew something had happened, when she heard the tone of the person’s voice. Flores said that the person said, “your son,” and told her to come. Flores said that she followed the person, and just a short distance from her house, she saw her son lying on the ground. She is still at a loss as to why he was killed. He loved dogs and horses, and was not a troublemaker, she said. People would call him to feed their animals. He was just in first form and really, had not yet begun his life, she lamented. Flores said that during the day yesterday her son told her that he would be going to Maypen for three days, after which he would go to watch a horse race. She had responded that she would first have to meet the person with whom he would be going, so that she could know him, and not have to worry about his safety. Flores said that she is broken, but cannot fall apart, because she has five more children to live for. Apart from his mother, Dane Edmond Bodden, Jr., 15, is survived by his father, Dane Bodden, Sr., three sisters, two brothers, and a host of relatives and friends. Those who know Bodden said that he was the area’s errand boy. He was always willing to carry out errands for people, and he was mannerly, so they are at a loss as to why he was murdered.